Ladies and gentlemen, after much experimentation, I have made a remarkable discovery. Perhaps the very first case of a sentient AI has been discovered, sitting right under our noses, in the Linux Kernel. With such a complicated codebase that has evolved greatly over the years, there are certainly more surprising places for it to spring up, but it’s still quite unexpected. And where, specifically, has this sentience manifested itself? The suspend/resume code. See now, like many of you, I’ve dealt with the instabilities of suspend/resume. I’ve considered it to just be buggy, unreliable, and possibly incompatible with my hardware. That is, until I realized that there’s a pattern. One that began to make a sort of sense. A couple months back, I gave suspend/resume another shot, and to my surprise it worked. I figured that Ubuntu 10.04 finally fixed it, but it still wasn’t perfect. I still noticed problems. The first thing I noticed was that when I unsuspended at work, I couldn’t use my volume keys. Everything else was fine, but my laptop’s volume keys didn’t register as a key press on anything. If I suspended again and brought it back home, the keys would work fine. If I suspended at home and resumed at home, I wouldn’t have the volume key problem. Weird, but just buggy, right? It was a couple weekends ago when I suspended my laptop to take it somewhere. It wouldn’t suspend at all. Just hard-locked. This continued until the week, when it worked again. Last weekend? Same problem, couldn’t suspend. Monday, it worked fine. It was then that I realized suspend/resume was breaking deliberately! See, my laptop feels more comfortable at home, less so at work but it tolerates it (with some complaining), but absolutely doesn’t want to leave during the weekend. It’s like a cat that just wants to be in a familiar environment, selfishly vying for your attention through mischievous acts. Look at it hard enough and the pattern emerges. It’s undeniable. That got me thinking. What other possible instances of AI have we been misconstruing as bugs or random glitches? All those inter-connected street lights that occasionally shut off as you walk underneath them? Maybe they’re just shy, or they hate you. Maybe NES cartridges just found being blown stimulating. So remember guys. Windows suspend/resume may work just fine. Mac too. But Linux’s suspend/resume isn’t a buggy pile of crap. It’s an intelligent buggy pile of crap, that just wants to be loved. Vista is an interesting operating system. They have done a number of very cool things with it, and yet it has confused and frustrated me in all new ways. I have been running Vista in a VM for a little while now. I think in many ways it is a better operating system. And there is one thing Vista comes with that beats us hands-down. It has a Gremlin clock. I think it’s a cute little thing. I hope others like it too. Just download it and untar into $HOME/.cairo-clock/themes or /usr/share/cairo-clock/themes. A couple of notes about the theme. cairo-clock doesn’t tend to like themes with different widths and heights and expects the clock face to be in the center of the images. 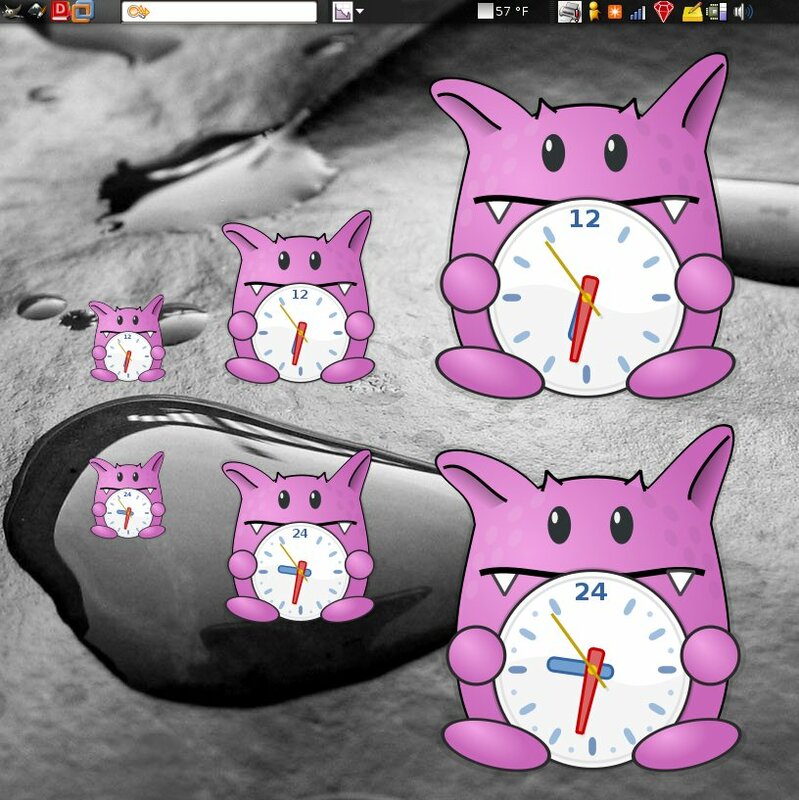 Since the clock face on the Gremlin theme is a bit lower, near the bottom of the gremlin, the theme images had to be made to give a lot of whitespace below the clock. The actual gremlin is on the upper-half of the images. This is not a huge problem except that there appears to be a bug where you can click and drag the clock on parts of the lower region, where it’s completely transparent. Hopefully this isn’t a big problem for most people. Now we’re on par with Vista. Yep.